The R. Dower Book Series, launched in January 2012, is a special book search named for one of our chief intellectual progenitors, R. Dower, Metaphysical Imaginary (1949 – 2010). Though chronically reclusive and a religious opponent of word processing technology, R. Dower knew how to spin a yarn… and then loop it three times around Alpha Centauri. Books in this series will be printed in memory of R. Dower as our attempt to preserve his memory and passion for wordtelling and storyplay. Our aim is to publish writers of all levels. Words matter most. Familiarize yourself with our publications to get an idea of our preferences. We are particularly interested in short story collections, novellas, long-form poems or poetry collections, novels, or other things of this breed. Reading for the R. Dower Book Series is ongoing. When we find something we like, we will temporarily suspend submissions in order to devote full attention to bringing the next book of the series to press. There is no reading fee for standard submissions to the R. Dower Book Series. However, a $10 reading fee can be added to submissions if the submitter is interested in receiving comprehensive, critical feedback on their work. This nominal fee will be used to offset editorial review and response time, and contribute to the R. Dower endowment. 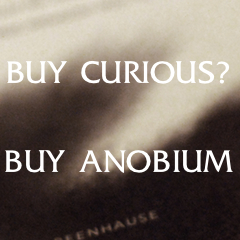 You may also add $2 (for a total of $12) to the fee to receive an Anobium release of your choice. All submissions, paid or unpaid, will be equally eligible for nomination. All paid submissions will receive comprehensive, critical feedback. Unpaid submissions may also receive feedback, though relative to the amount of submissions, this will be left to editorial discretion. 1. Procure a 15-25 page sample of writing you would like to be included in a book. This initial submission should be a sample of your complete work (or work in progress). 2. Ensure that the file is .doc, .docx, or .rtf only. If there are images, sketches or illustrations you would like to include with your manuscript, you may also include these. 3. (Optional). If you wish to receive feedback, you can make your PayPal payment: $10 for standard submission & review OR $12 for submission, review & book. 4. Compose an email to editor@anobiumlit.com. Attach your manuscript. In the body of the e-mail A) tell us a little bit about yourself and your manuscript, B) tell us any special requests, C) list your PayPal receipt/transaction number (and your book choice, if you made a $12 payment). 1. Procure a 15-25 page sample of writing you would like to be included in a book. Ideally, your final manuscript will be longer than this. This initial submission should be a sample of your complete work (or work in progress). 2. Ensure that the file is typed and that you also have a digital copy of the file, as we will not be returning your manuscript. If there are images, sketches or illustrations you would like to include with your manuscript, you may also include these. 3. (Optional) If you wish to receive feedback, make a check or money order out to Benjamin van Loon. $10 for standard submission & review OR $12 for submission, review & book. 4. Address an envelope to Anobium, c/o Benjamin van Loon, 2557 W Eastwood Ave, #2, Chicago, IL. In the envelope, include A) your manuscript, B) a note telling us about yourself and your manuscript, C) your book choice, if you made a $12 payment, D) a SASE or e-mail address for us to send our response. Those published as part of the R. Dower Book Series will receive a refund of the reading fee, complimentary copies of their book and a humble but meaningful renumeration. As with all Anobium books, those published as part of the R. Dower Book Series will be skillfully designed and printed in limited-edition, perfect-bound paperback copies. If you have any questions, please e-mail us at editor@anobiumlit.com.